Welcome to REBELDOG, Situated in Capel, Western Australia. I got my first dog, a Dobermann, in 2001. "Mack" Aegis One Night of Sin AD JD WAC. She was brought as a pet and introduced me to a whole new world of dog trialling. She was not too interested in obedience but just loved agility. Gaining her agility and jumping titles. She also gained her WAC a temperament title. Sadly she passed away aged 12.5 years old. She has left a huge hole in my heart, as she was my best friend. In 2005 I began looking for another dog to do obedience and try showing. I some how stumbled across Portuguese Water Dogs. A rare breed in Australia with a big personality. So along came "Lacy" Neuter Champion / Australian Champion Karlyermai Dekt N Lace CCD RA. After she gained her showing championship she was desexed as her breeder wanted to breed from her without health testing and would not sell her to me fully. I am a firm believer that it doesnt matter how pretty the dogs look if they have or could pass on prevetable hereditary diseases that can be tested for and advoided. In 2007 she gained her CCD obedience title and 4th place at the state obedience trial. Making her the FIRST Obedience title PWD in WA (and now "Bruno" is the second). Then in 2008 the "show bug" hit me again and we welcomed a beautiful PWD boy into our family. "Bruno" Australian Champion Rulett Dive Dive Dive CCD RN ET. He has done very well in the show ring so far, gaining his show title in Feburary 2010. In June 2010 we gained "Bruno's" Endurance Title after running 20km. He is the FIRST Endurance Titled PWD in WA. "Bruno" and I achieved his first CCD obedience pass in August 2010 with a 4th place. "Bruno" and I got another pass at the Perth Royal Show 2010 with a 3rd place. I was surprised that we passed as there were a lot of distractions, but "Bruno" proved me wrong. Finishing off his CCD title in style with a 1st place 93/100. Both "Lacy" and "Bruno" have now competed in rally obedience. "Bruno", "Lacy" and I gained their rally-o novice titles in April and May 2014. "Lacy" then continued on to get her rally-o advance title in October 2014. "Lacy" achieved her Neuter Championship title in 2015. 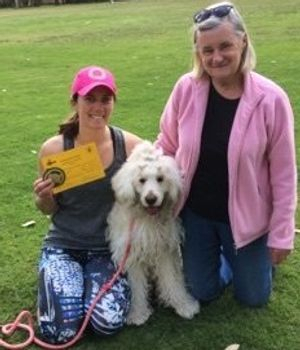 Making her the first Neuter Champion PWD in WA. She is such a show off even in her old age!! "Bruno" passed away in March 2016, taken too soon. After things had settled down I got a precious gift. "Harpo" Australian Grand Champion Rulett Crème De La Crème HTM.S ET, a crazy white PWD. He is fitting in well and in his first 6 weeks with us gained his Australian Champion title. In 2017 "Harpo" and I completed his Endurance title. "Harpo" and I gained his Heel work to music starters title in October 2018. Making him the first Dancing with dogs titled PWD in WA. "Harpo" has also started in rally-o with 2 passes so far. "Harpo" became a Grand Champion in March 2019. He will now semi retire from showing to concentrate on his working career. My family has welcomed a new family member. A French Bulldog called Scarlett. She is my dad's pet but I will be borrowing her to do dancing with dogs and rally-o. Watch out for us!! I am also stared to sell my designer collars, tug toys and pet beds in 2015. After making them for the past few years and donating them to S.A.F.E rescue and obedience clubs for them to sell and raise money. I have decided to try selling them myself. Check out Rebeldog Pet Products on facebook. I have no plans to breed any time in the near future. But for any information about showing, obedience, agility, or general dog issues feel free to email me. 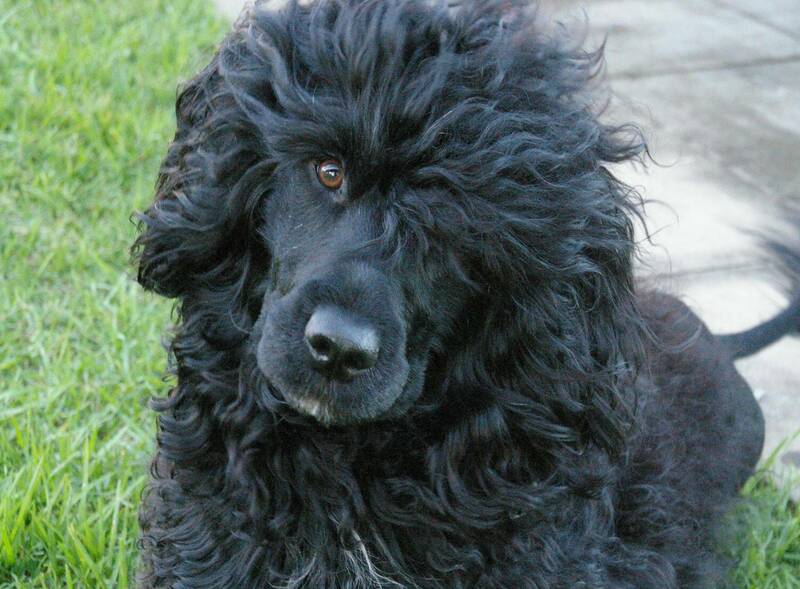 Also if you are after a Portuguese Water Dog, then I can help point you in the right direction for a reputable, registered breeder. REBELDOG Where temperament and health counts! "Bruno" and I after gaining his Endurance Title. "Harpo", mum and I after gaining his Endurance title.